Three in a row SEC champion ! T-Town Alabama. What does it take to be the Best? Dedication, Hard work, and a Cochin staph that is the Best of the Best to teach that you are the Best and how to get there. Working together as a team is Paramount to success. Individual effort becomes the back bone of the Team! Alabama's Tide Football Team three time in a row SEC Championship Is the Best of the Best! 20 14 15 and 16 ! Roll Tide Roll ! 12-2-2015 Another mass shooting! This time in California, 14 dead 17 hospitalized. Why are we still allowing AK-47s to be sold? Why if suspicion was aroused, no one said anything. Wake up America, people are afraid and fear creates anxiety that could lead to more violence. This has got to come to a halt, running out and buying a gun for protection is not solving the problem at hand. Be vigilant watch your soundings far suspicious behavior and notify the police! My prayers go out to all the families caught up in the horrific tragedy. God B less America! Good morning everyone, the list of Ball games is long today :-) I am trying to pick the ones I want to see, think I will start with Notre Dams at Pittsburgh at 11 and Florida State at Clemson at 2:30 Auburn at Texas A&M at 6:30 and the Big game LSU at Alabama at 7:00 What a day! My back is still giving me problems, to much sitting, but I have the games planed with a TV in each room to see the games as I walk!!! Roll Tide Roll!!!! Looks like the rain is over for a few days! Beautiful day today, warm into the mid 70s some may see mid 80s. T-Town is bustling with the event coming up this Saturday LSU fans are already coming into town and the Bama fans are getting excited. Should be one heck of a game! Rain and the ground is soaked! No Golf for me today! Just as well I have a cold and aching back! Will be warmer in a day or two maybe I can play then, before the rain comes back in. We are just a sand pebble in eternity, however loved by the Creator of all that is, was, and ever will be! On this feast Day of all souls, I tremble at the thought of Our God giving His only Son, that we may have eternal life. By Jesus death we are set free to enter into eternity with the fathers chosen ones! If that doesn't give you chill bumps nothing will! 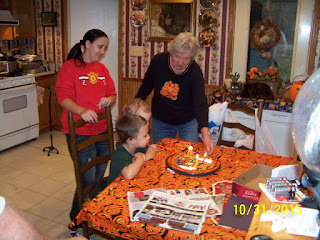 My sons Birthday this weekend with the great grand kids went well, he really had a good day. 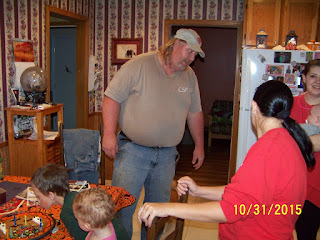 Good evening friends, here it is the end of Oct. 10/31 2015 and I'm still struggling with face Book! Why I don't know. Gossip, pictures, friends, news? Why can't I just stop!!!! I suppose it's not having much to say, most of my post are just small talk and a photo here and there. in the forties. He has really enjoyed having the children here. Before they go home we will light candles on his big Halloween cookie and sing Happy Birthday. The kids will get a kick out of that. It's also my son in laws Birthday and Couch Nick Saben's Birthday! Roll Tide Roll. Auburn lost to Old Miss today, now they own the State in Foot Ball. Tide plays LSU next week, and will be a tough game for Bama. Well will close for now, have to take the kids home, have a Grand November, hope you remember to turn your clock forward tonight!